co-direct cartoons for MGM. Their first release, Puss Gets the Boot (1940), introduced their first pair of famous characters — a cat named Jasper and an unnamed mouse, who quickly became Tom & Jerry. It also garnered the pair their first Oscar nomination. The directors' tenure at MGM lasted until 1957, the year MGM decided to get out of the cartoon business. By that time, Hanna and Barbera had created a minor character here and there, done a non-series cartoon or two — and directed over 100 Tom & Jerry shorts, seven of which won Academy Awards. MGM later got back into theatrical cartoons, at least briefly, but by that time, the Hanna-Barbera Studio was far too successful, producing cartoons for television, for its founders to consider going back. The fledgling studio had cartoons on the air within months. Ruff & Reddy was a series of shorts much like they'd always done, except less expensively produced. It was packaged for TV just like the old theatrical cartoons, too, one of three segments in a half-hour show. This gave the producers less control over their own work than they could have if they were handling the entire show — a factor they quickly moved to eliminate. From their second production, Huckleberry Hound, on, the studio has produced nothing but complete shows. To cut production costs to the bone, Hanna and Barbera worked out a system of what they called "planned animation". Instead of animating an entire figure, only those body parts that moved were animated, with the rest held steady — that way, most of the body could be treated as background, with one drawing sufficing for an entire scene. Also, animation sequences, such as walk cycles, were transferred from one cartoon to the next or even between one series and another. This made for a certain sameness in movement, but saved a lot of money. They even swiped from themselves. Yakky Doodle, who starred in one of the segments on Yogi Bear, was a virtual duplicate of Little Quacker, a supporting character in several 1950s Tom & Jerry cartoons; and Augie Doggie & Doggie Daddy, a segment on Quick Draw McGraw, were a reincarnation of Spike & Tyke, a minor series they'd done at MGM. Techniques like these enabled Hanna-Barbera to produce mountains of animation, quickly dwarfing their decades of theatrical output. This worked out just fine, as TV had a voracious appetite for programming, one that could never be satisfied by repeatedly recycling the mere few thousand shorts the American movie industry had produced in its entire history. Compared with TV, the waning theatrical market was scarcely worth bothering with. This didn't quite stop them from bothering with it, tho — they launched Loopy de Loop as a theatrical series in 1959, but dropped it in '65 in favor of exclusive reliance on the television market. 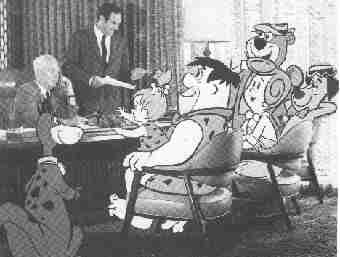 Hanna-Barbera made a breakthrough in 1960 with The Flintstones, the first successful prime-time animated series ever to be broadcast by an American TV network. It sparked a brief fad in prime-time animation — in which Hanna-Barbera was a prominent participant, with The Jetsons and Top Cat — but The Flintstones was by far the longest lasting and best known. In 1964, Hanna-Barbera released its first feature, Hey There, It's Yogi Bear. The studio has released dozens of features since, including The Man Called Flintstone, Yogi's First Christmas, The Jetsons Meet the Flintstones, and many others. '64 was also the year they took animation in a whole new direction — their Jonny Quest sparked a trend toward serious adventure cartoons, that is with us yet. Like MGM, Hanna Barbera moved quickly to license its properties to comic books, starting in 1958, when Dell Comics began publishing Ruff & Reddy. In 1962, like most of Dell's licensed properties, the Hanna-Barbera characters were transferred to Gold Key, where they all stayed until 1970. That year, Charlton Comics took over most (the rest followed in 1975), and from 1977 to '79, they were at Marvel. They were out of print for several years, until Harvey Comics picked them up from 1992-94 and Archie from 1995-97. Starting in July, 1997, they were published by DC Comics. The licensing goes two ways. Hanna-Barbera has produced many TV series licensed from comic books, such as Super Friends, loosely based on DC's Justice League of America; Fantastic Four, based on the Marvel comic of that name; and Josie & the Pussycats, from an Archie comic. They've also done The Addams Family, which was based on a TV show based on a cartoon. Hanna-Barbera went on to become an industry juggernaut. In 1991 it was acquired by cable mogul Ted Turner (who already owned the studio where Hanna and Barbera first got together). When, in 1992, Turner started Cartoon Network, he fueled it mostly from his own animated properties, the bulk of which had been produced by Hanna-Barbera. In 1996, Turner's holdings were themselves merged into Time Warner, which already owned the Warner Bros. movies (including cartoons) and DC Comics. The Hanna-Barbera Studio is now in its third generation of fans. With Cartoon Network ensuring their continued airing — along with a second channel, Boomerang, which premiered in April, 2000, programmed entirely with their 1958-76 output — it seems likely those cartoons will have fans in many generations to come. Text ©2000-10 Donald D. Markstein. Art © Hanna-Barbera.